Back cover blurb: People don't need to know you're a murderer. They just have to think you could be... June 1980: 17-year-old Kelly Lund is jailed for killing Hollywood film director, John McFadden Thirty years later, Kelly is a free woman. Yet speculation still swirls over what really happened that night. And when her father-in law, and close friend of McFadden is found dead - shot through the head at point-blank range - there can only be one suspect. But this time Kelly has some high-profile friends who believe she's innocent of both crimes. But is she? 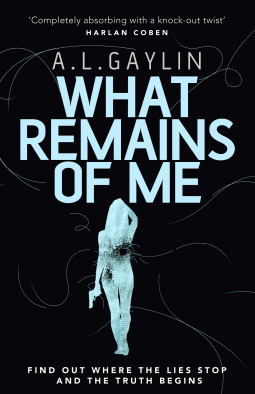 What remains of me is a thriller with a difference. It is a novel that will make you think, and it will also leave you feeling uncomfortable at times with its plot. It is a novel whose characters always act with a purpose. Who is to say if what they are doing is right or wrong? They are the kind of characters mostly, that will carry on and do it anyway, regardless of others opinions or their own morality. Kelly Lund is released from prison having served her sentence for the murder of Hollywood film director John McFadden. Thirty years after her sentencing as a teenager, Kelly is free to begin a new life with her husband, one of the only people who stuck by her for all the years she was locked away. But when someone close to him is murdered, for the first time ever he questions his wife's innocence. He is one of the only people who ever believed in her. Could that be about to change? As Kelly has links to the deceased, it is not only her husband who doubts her. Naturally as an ex jailbird she is one of the Police departments first suspects, but she is adamant that she had no involvement in the murder. This time will she be able to clear her name before it is too late? What remains of me is available from 1 December 2016.